Once upon a time, in an art colony, nestled along the beautiful California coastline, there lives a Mom named Sam. Sam believes in the magic of imagination, the ideals of peace, and the power of love. She dreams of a World where all kids are healthy, happy, and free. One day, inspired by the love of her boys, Sam set out on a journey to help change the World. She discovered Storytime Yoga and its' teacher certification program and soon became a storytelling yoga teacher for kids. 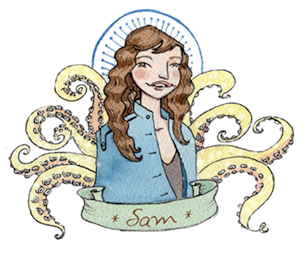 Sam's formal education, as a graduate of the University of Virginia, corporate career in luxury hospitality management, yoga teacher training and active practice, and most importantly, her gift of being a Mom, inspired her to create a unique and pioneering yoga program for kids, popularly known as Mindful Octopus. When Sam reflects back on the chapters of her life, she is forever grateful for her teachers, mentors, family, and friends, and especially for the most inspirational teachers of her life, her sons, James and Oliver.